Just like adults, the obesity epidemic is hitting teens hard. But if they're trying to lose belly fat, teens should not follow a restrictive fad diet that promises quick weight loss. For a teen, it's more about creating healthy habits so his middle trims down as he slowly grows into his weight. Skipping meals, eliminating food groups or not getting enough calories can seriously affect a teen's health. Talk to your teen's doctor before making any changes to diet or activity. According to a 2015 review study published in the European Journal of Public Health, TV time is directly associated with obesity, with a 13 percent increase in risk for every hour of TV watched. The American Academy of Pediatrics says teens should watch no more than one to two hours of TV a day. Instead of watching TV -- or other screen time with computers, cellphones and video games -- encourage your teen to read a book, work on an art project or listen to music and dance. Better yet, spend time with your child enjoying an active hobby such as gardening, flying kites or hiking. Encourage your teen to eat more fiber-rich foods, such as fruits, vegetables, beans and whole grains. A 2012 study published in the Journal of Clinical Endocrinology and Metabolism found that teens who eat more fiber have less belly fat. Up your teen's fiber intake by offering fruits and vegetables at meals and snacks, switching from refined grain foods such as white bread to more whole grains and adding beans to soups, grain dishes and salads. Encourage your teen to eat only when hungry and stop when he feels full. Remind him to eat slowly and wait at least 20 minutes before going for a second helping. These skills may take time to master. Have your teen keep a food journal to help monitor food intake, especially as it relates to feelings he's having when he wants to eat. Writing down his feelings may help identify patterns, such as wanting to eat when he's bored or upset. There is a strong association between sugar intake and belly fat, according to Rush University Medical Center. Sugar is in a lot of foods, from salad dressing to ketchup to candy and other sweet treats. It's never a good idea to totally eliminate foods from a teen's diet because it may make her want them more. To help limit temptation, keep your kitchen stocked with healthier options. But if your teen wants a treat once in a while, such as a piece of cake, it's OK.
TeenHealth: How Can I Lose Weight Safely? 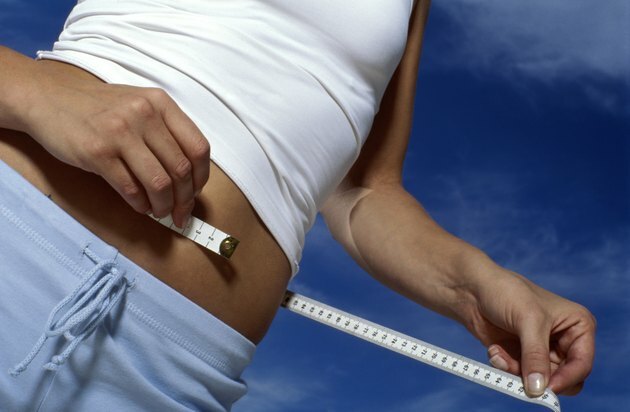 Rush University Medical Center: Is There "One Trick" to Losing Belly Fats?